The little girl begs,” don’t cry”, as she gently strokes her mother’s hand. But she couldn’t console her mother. It was late evening and the small village of Cilia, one of the five villages “safe areas” of your kingdom is taking it’s last breath. Mary and her five children are among the four hundreds who had taken refuge here from the invading Myrians. Her husband was killed two days earlier, but she managed to save her three sons and two daughters. Around them now screams could be heard as people flee for their lives. She grabs her children and heads for the forest, melting into undergrowth as the slightest sound. Terror at night: losing control. South to Cilia is a farming village surrounded by thick woods. In the thick grove, Myrians observe the village avoiding any detection. Then without any warning, some five hundreds swarm in. Very few gets a chance to escape. Farms, mills, homes are burnt down. Even before the ashes of the burnt could cool down, the next village was attacked. The news of the attack reaches you. The Myrians have started to bar the way north . Somehow they only seem to invade at dark and your castle lying near to the edge of the sea is getting cornered. The Myrians, the forces that has massacred an estimated nine hundred people remain at large. Battle their open aggression. *looks at map* *starts drooling* wow. that is cool. it looks like the player at the bottom rights is gunna die. that look really awsome. lol.Well i usually play at the lower left side of the map. SO i guess that's where the player fits best. 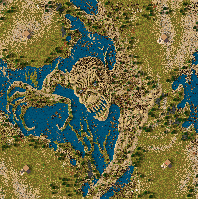 Terrific and terrifying minimap art, extremely well done! p.s. The pictures aren't working for me, did you use image shack? To me, playibiliy in skirimish maps, is 90% how Ai's doo during the game. Like all of your maps, the enemy ai's function flawlessy. Also, most methods that humans use to get and edge (rushing, lots of fire balistas) have been prevented. The map is seem imperfectlely ballanced when it comes to land area (left side has slightly less) but "the concerntration of stone and formation of land prevents further biulding which is the same size as the left sides" and rescorces are nicely distrubited. I would give this a 4.5 if I could. THe only other map I've seen featuring a face in the minimap is another map by this author, and even that eas no where near as detailed (or creepy) as this one. Look at the minimap and tell me that this deserves a 4. Apart from the very detailed umm.... Thing that is prometly loacated (look verrrrrry carefull at the center of the map, and youi may see a strange face perrng back at you) the rescorces, path ways and grasslands are distrubited nicely. In fact, this map taught me how to place crows (onm top of skulls on sticks, which are placed on cenrulations) The only flaw that I can see is a single rock blocking the entrance to ear. But this is no big deal as there are other entrances. Hey! Aribic Ai's can use the blocked thngs? That's not fair! Another perfect map by surajsubba. No i didn't Lord Ako. I can see it just fine. yeah the story has no conncection to the design nor the map. "The map is not perfectlely ballanced when it comes to land area (left side has slightly less, but rescorces are nicely distrubited. I would give this a 4.5 if I could." -----If you look carefully the concerntration of stone and formation of land prevents further biulding which is the same size as the left sides. And the map had to have a body for Eddie ( the figure in the middle) lol... i just had to provide extra space for that. Edited: the biulding restrictions doesn't apply to Ai's at all. It's meant purely for the player. There's always the choice of playing on LAN,that way all players will witness the same effect. freaking killer design!! Already downloaded and I am starting up the game right now. Wow, that minimap looks more impressive than 'a giant once walked here' by Bismuth. K4pod ! it works fine. Other's reviews,comments are most welcome.